Flamingo Bar in St. Petersburg, FLA.
And Syracuse is losing again...it must be March. It's the weekend after Kerouac's birthday and the Flamingo Bar is still reeling from the hangover. 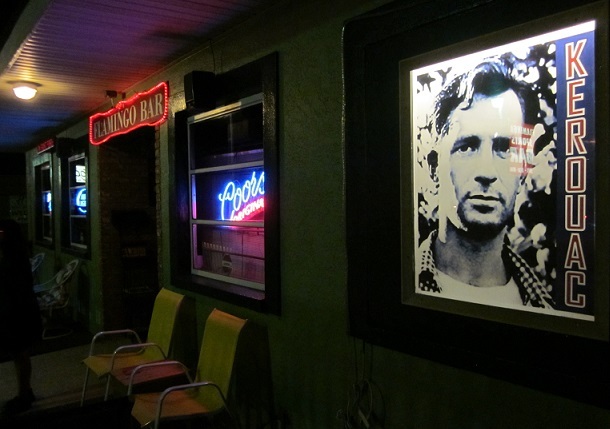 The bar has done well for itself as Jack Kerouac's last call. Not as well as the White Horse, but St. Pete's doesn't have the literary tradition of Greenwich Village. Whereas Kerouac was known to drink at the White Horse there is no evidence than Thomas ever set foot in St. Petersburg...let alone the Flamingo Bar. The Flamingo will always be October 21, 1969. There are not that many Kerouac pilgrims coming to St. Pete's. The Flamingo opens its doors to the faithful on the occasion of his death and the occasion of his birth. Then it returns to being the Flamingo. A blue collar bar. A working man's bar in a working man's neighborhood. One can see why Kerouac was attracted to it. Other than the pictures of Kerouac on the wall and the flat screen TVs what else has changed since 1969? Syracuse is on a 15-6 run. Even though all the TVs are tuned to the game and no one is shooting pool, no one is paying attention. Not to the game, not to the ghost of Ti Jean. There is a Kerouac Special – whiskey and a wash for $2.50. You can't find a draft beer at the White Horse for less than five bucks. At the Flamingo you get the house whiskey and a glass of draft for half that. When you order a Kerouac Special at the Flamingo Bar, Mary slides it to you with a smile. She knows why you are here. There is a floodlight advertising the special in the parking lot. You are off the beaten path. Behind the bar at the White Horse is taped a sheet of paper, "To all employees, Jim has no friends or family. Be suspicious of anyone claiming otherwise." It's a different vibe. The ghost of Kerouac doesn't give tips but Mary hopes that you will. Older than Kerouac was when he died, Mary gets by from the generosity of the regulars. The one's with the dirt under their fingernails. She doesn't offer fanciful anecdotes or fanciful excuses. She serves you a drink with a smile. This is not the White Horse. Syracuse is now down by five. Stale cigarette smoke from more than 40 years clings to your clothes like the last dance at the end of a lonely night. Everything at the Flamingo is sepia toned. There are more ashtrays around the horseshoe shaped bar than there are stools. Ashtrays are now museum pieces in New York. Kerouac never wrote anything that resonated in the last years of his life. His home in Orlando where he lived when On the Road was published is landmarked but not so the home in St. Petersburg. New York? There are walking tours dedicated to his apartments and haunts in the Village and Morningside Heights. There is no evidence, anecdotal or otherwise that he ever spilled blue ink inside the Flamingo Bar. The night wears on and Mary pours another Kerouac Special. A toast is raised to footnotes and Syracuse goes down to defeat. nice....wish i was on the poetry scene when i live in florida...the place sounds like it has quite the atmosphere and i have grown to love jack as well...ha...also like how you used the game in this...smiles. Thanks Brian, Syracuse has been breaking my heart since losing to Bobby Knight in the 87 final. Unbeknownst to me at the time my wife to be was a student at Indiana. Now, you aren't going to believe this, Mark, but I lived in St. Pete. for 10 years before moving here to Mexico. I wasn't aware of the poetry scene in that area, mainly because I didn't write in those years. I don't recall The Flamingo, but my husband says he does. This just proves what a small world it really is.